Bleach 653 see’s the defeat of Lille as Shunsui and Nanao absolutely destroy the God’s Trumpet attack by reflecting it towards Lille, cutting his body and causing his body to disperse into a large number of piece. We visit the past for a little while when we learn that Shunsui’s brother found peace when he married Nanao’s mother. Bleach 653 begins as Shunsui’s brother receives a hairpin from Nanao’s mother. He asks why just one, when she mentions that when she’s suppressing hollows and he’s not around, she wants to know that she’s holding to the same things he is, it inspires her and keeps her strong. Shunsui watches with a derpy face when his brother smacks him telling him to go home and do work. Shunsui asks him how he’s changed and become much calm and content. His brother mentions that it might be because of the kindness that Nanao’s mother has shown her. This is why Shunsui holds the two hairpins, for his brother and his wife. Nanao keeps on fighting when she finds the gear of holding a sword. She had no idea fighting with a sword could be so frightening she mentions. She is unable to move, it seems that her own sword has cut her, it’s probably the light that burst out just now. She mentions that ti hurts, and she didn’t know being cut would hurt her so much, she is also quite scared. Out of nowhere, we see Shunsui show up behind her as she feels his support. 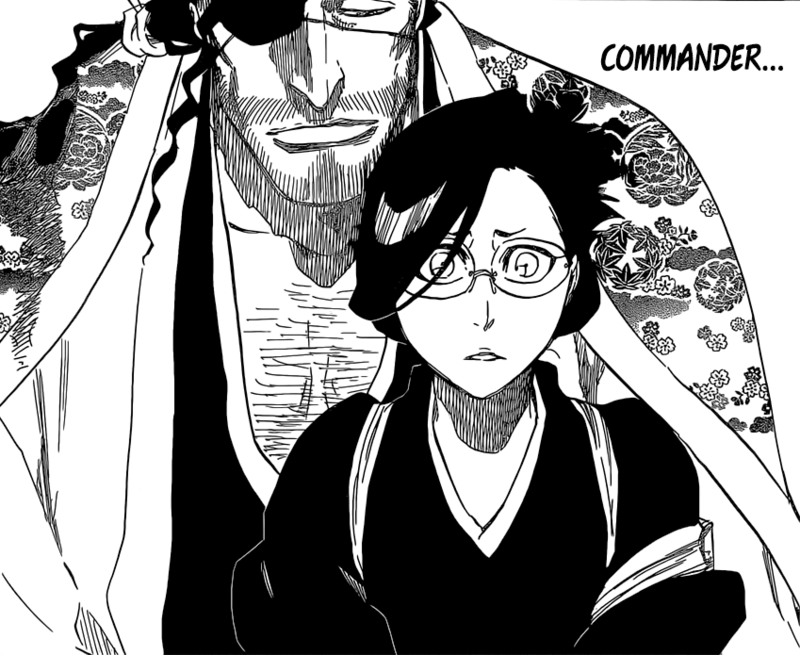 Lille notices that Shunsui has shown up, on top of that he’s hiding behind Nanao. Lille calls upon one of his strongest abilities called the God’s Trumpet as she tries to release its sound to kill all. 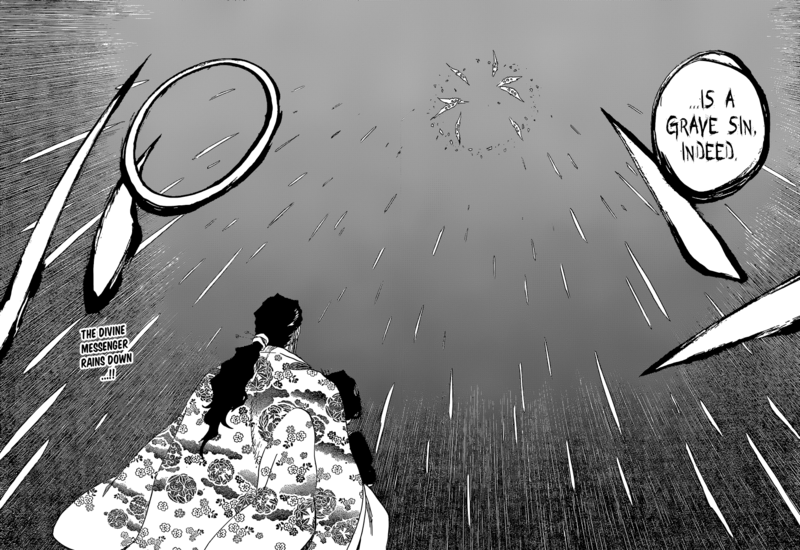 As it begins, Nanao is told by Shunsui that it’s time to attack, he will be right behind her. She feels the compassion within him towards her, even after she arrived there to help him, it’s her that requires the help. However, now she grows stronger. The God’s Trumpet sings loudly as it begins to destroy the landscape the longer they’re on there. However, one thing still exists, this being the fact that Lille’s body is literally cut in half after using this ability, Shunsui and Nanao still stand as Lille notices that his body has been completely destroyed and cut, he remembers the properties of the sword at reflecting Godly attacks. His body begins to crumble and fall to the ground as Nanao and Shunsui watch on. Bleach 653 ends here. A fantastic chapter, even if it was a little late, it seems that it was quite similar to the previous I had previously written. Anyways, I honestly can’t wait to see what happens next. 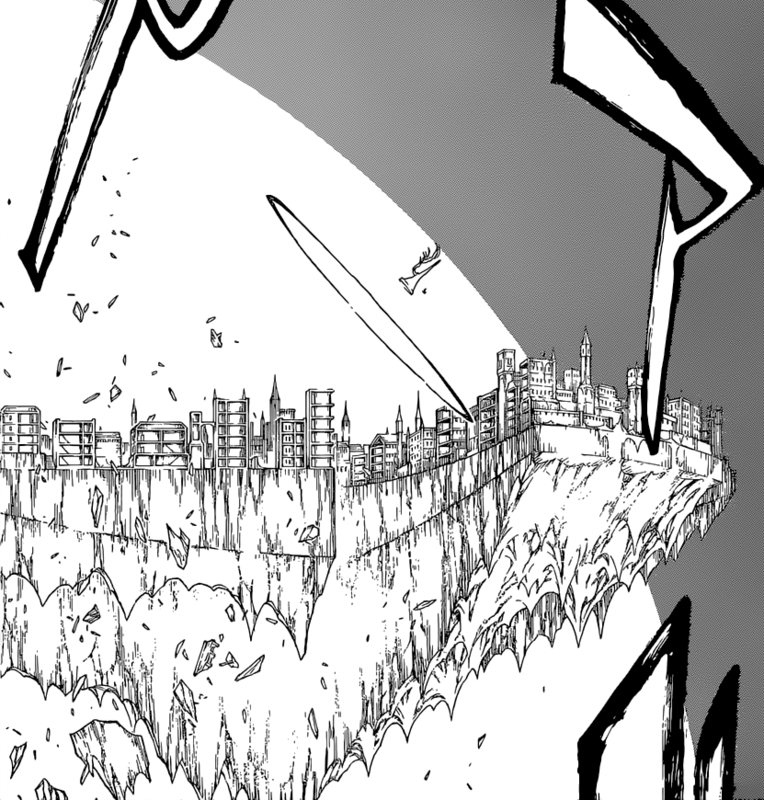 Can’t wait for next week’s Bleach 654, when the story continues. I’ve gotta say, that last technique Lille used was so powerful. It was weird how he didn’t get mad or anything when he lost. I wonder if he’s dead? That was such a weird ending, I seriously hope Ritter C & X are dead (but Kubo doesn’t kill characters sometimes). Both are really boring, move on to something important in the arc. I’ll admit Lille is kinda boring. But Pernida sure isn’t. She’s part of the story with the Soul King. So I doubt she’s dead. Lille is most likely dead. The Soul King’s dead so Pernida probably won’t matter anymore, unless they can piece the Soul King back together which they can’t. At this point Pernida is only good for a flashback & more info about the past, battle wise no. Dis you forgot Vollständig??? Pernida didn’t even use it against Mayuri and Nemu. Battle wise it’s still has alot too show. That, only with her tie to the Soul King is more than enough to see Pernida return. Pernida (black form) to the Hand, isn’t it the Vollstanding transformation? Just like when ritter C gunman turned to the Owl. Even if that’s not the case, Kubo won’t show every Bankai & Vollstanding, he doesn’t need to. We already skipped Uktitate’s Bankai. what a waste to skip Ukitake’s Bankai…i mean Ukitake’s been captain for all of the time since the series started…at least show us his bankai…he been called an equal level of Kyoraku in fact he is so ill…. Ukitake isn’t dead. Mayuri said he was unconscious. If he does die, we most likely will see his Bankai in a flashback. Kubo said in an interview that he would reveal all Bankai. While it’s true Kubo doesn’t need to show all Vollständig and Bankai, the fact that Pernida is one of the Schutzstaffel and final Quincy to fight, I believe we will see it. And no her hand form is not a Vollständig. That’s When She’s using The Left Arms Power. Hey Nick, I agree with you on this one! Lille was definitely boring for me and the way that he went out was pretty bad imo. One shot took him out after all of that build up? Sure, it was meant to slay “gods” (The meaning is pretty loose in Bleach) but I wanted more of an actual fight. I am glad that we’re finally moving on though. Ya when Nanao came into the fight it go boring quickly. At least Shunsui’s Bankai was epic and forced Lille to his power up form. I’m expecting a flashback for Lille. Kubo really showed off his abilities and personality. Especially with his final attack and his denial at death. I’m glad he didn’t ramble on about being an unstoppable god like Barragan. Considering these are the last Quincy so far, I think Lille deserves a flashback. Well with Zaraki, his Shikai was unexpected. But it does fit his personality. This chapter seemed a little short. Lille was defeated in one attack. It seems kubo was didn’t want to drag this battle. I think the next fight is askin. Lille knew that he can’t force others to accept his idea of God and so he has no right to be angry for failing to defeat the shinigami. Yup, agreed on it being short but it just solidified the fact that this sword has the capability to battle against God. Maybe it’s possible to use it against Yhwach, but I’m sure he’d be able to see it a mile away. 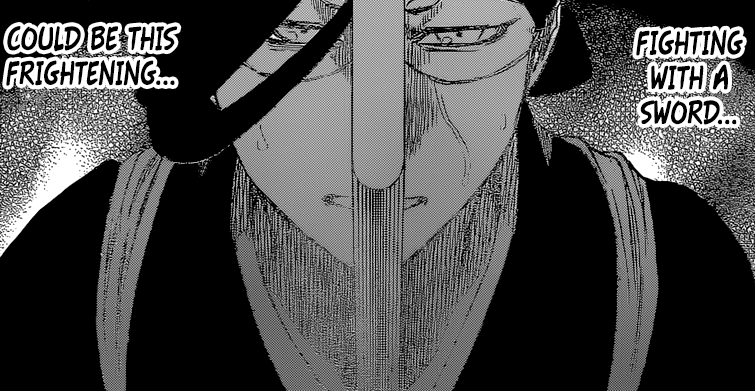 The Zanpakuto is good to use against a god like Yhwach and now Aizen and celestial beings like Lille and Pernida. I have heard theories that thus Zanpakuto may be the cause for why the Soul King has no limbs. Why his two arms became sentient beings that became one with two completely opposite spiritual beings like Jushiro (Shinigami) and Pernida (Quincy). Also, Nanao’s mother said she surpasses or pushes back Hollows. Does that means she’s a Shinigami? Same with Shunsui’s older brother. He is wearing a Shinigami uniform in this flashback. Compared to the Pernida fight it was short. But as a battle is wasn’t. His death is similar to Barragan. Killed by your own power. Unlike Barragan, Lille didn’t seem mad. He was either in denial that he died or he didn’t realize that he did. I hope he gets a flashback. Kubo really showed off Lille’s ideals and abilities. Especially with this trumpet technique which is the instrument used by angels. His death was unusual. Well, this wasn’t my favorite chapter as I wanted Lille to put up a better fight in the end, but I’m ready for Askin vs Ichigo coming up! The rage shall be swift and sturdy. BTW, where are you up to in One Piece now Sunite? It’s been a while so I’m guessing that you may be in Punk Hazard or even further by now right? Personally, I don’t mind Lille’s second Vollständig form. It made him look more like an angle than his first Vollständig form. This transformation made way more sense to me than for example, Ulquiorra using Segundo Etapa and have none of his standard abilities change other than using Lanza Del Relanpago. At least Lille’s techniques in his second form made sense cause he gains arms. Just felt like commenting on this part. I completely agree with you. Lille should have had a more convincing defeat than this. I mean lille could have died by shunsuis hand instead of nanaos hand. But actually I am looking forward to seeing askins battle first in place of Gerald’s battle but that is just my opinion though to each his own.